First a brief note, then a great Jubelale reminiscence. As I was plotting that 10-year vertical late last year, a local Twitter buddy named Jason -- who I had not yet met in real life -- expressed an interest in attending it. That worked well with my plan to select a group of people to whom such a stunt might matter, as opposed to forcing it on bewildered friends and neighbors, so of course he got an invite once I finally organized it. 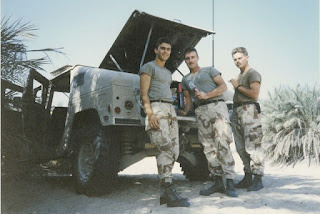 Attached is a photo of myself and a couple buddies in the Army. 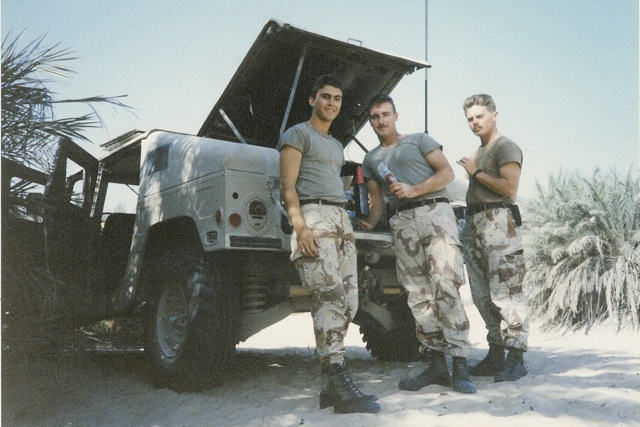 In December, 1990, we were stuck in Saudi Arabia waiting for the Gulf War. I had just turned 21 that summer and been shipped out to a dry country a week later. My dad smuggled in a care package of a dozen Jubelale bombers wrapped up in sweatshirts and other cold weather gear. Has been one of my favorites ever since. Jubelale bombers? Great call, Dad. Thanks to Jason for sharing the story and picture.